From Russia, With Love (and a little help from Roger). The first of two modified versions of a well-done Russian movie, filmed in 1962 under the title "Planeta Burg" ("Planet of Storms") by the Leningrad Studio of Popular Science Films. No kidding. The original story involves a manned landing on Venus, during which a group of cosmonauts and their seven-foot robot get separated from their comrades while exploring. The designs of both the robot and the astronauts' spacesuits are very impressive. Ditto for the land cruiser the cosmonauts use; it's a floating car that resembles those wonderful "cars of the future" which Detroit produced during the 1950s. In one scene the robot carries the cosmonauts on its shoulders across a lava flow. Venusian life forms include a few non-animated dinosaurs, but they aren't very threatening other than an attack on the floating car by an ungainly flying reptile. The plot is pretty sedate and actionless, but the dialogue is intelligent. After finding evidence of a low-level civilization, the astronauts speculate on the possibility that Martians tried to colonize Venus but somehow slipped back into more primitive state! Cool idea . . . 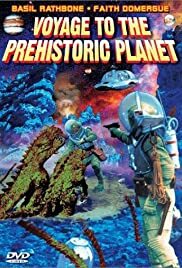 In 1965 Roger Corman bought the rights to the film, added some scenes with Faith Domergue ("This Island Earth") and Basil Rathbone, and then released it in America as "Voyage to the Prehistoric Planet". In 1968 he took out the former additions, added more footage, and released it again as "Voyage to the Planet of Prehistoric Women". In this third version, Mamie Van Doren and several other well-endowed beauties lay around on rocks by the ocean and make thoughtful faces while they have a telepathic debate concerning the "alien invaders" from Earth. The girls worship a dead pterodactyl until the end of the film, then they pull the wrecked robot from the ocean and start worshipping it instead (proof positive that a blond is a blond, regardless of what planet she's from). The cosmonauts and the girls never come face to face -- which is no surprise, of course, since their scenes were filmed six years apart on two separate continents. Mamie's scenes were directed by Peter Bogdanovich under the pseudonym Derek Thomas!